At Dental 359 we offer two quality Teeth whitening systems. Dental 359 was the first practice in WA to have the Zoom! Teeth Whitening system. This is the most advanced teeth whitening system available today. You may have heard of Laserbrite and Brite Smile. These are all older forms of technology used to whiten teeth. The difference with Zoom4! is that you achieve better results in less time with a lot less sensitivity than any other system on the market. Zoom4! is safe, effective and very fast! You do not need to make a consultation appointment for the whitening, providing you do not have any crowns, veneers or fillings on your front teeth, you will be suitable for the treatment. Teeth whitening only works on the natural enamel of teeth. The treatment is great for yellow teeth and for those with stains as a result of tea, coffee, red wine or stains due to aging. Our professional Dental Hygienists are qualified to do whitening including Zoom4! Whitening and all affiliated take- home products. With any teeth whitening treatment done in our practice, we recommend a professional clean and polish appointment before the whitening procedure to remove any build-up that can affect the whitening outcome. Whitening works best when your teeth have been professionally cleaned. The clean is optional but is highly recommended if you have not had a professional clean in the last 3-6 months. We can schedule a professional clean with our Dental Hygienists either a week or two before the whitening appointment and suggest doing so for optimal results. Sensitivity during treatment may occur in some people. The Zoom4! light produces minimal heat, which is usually the source of discomfort. The Zoom4! lamp can be adjusted for sensitive teeth. If you have sensitive teeth or are worried about discomfort, we can also recommend a sensitive toothpaste to be used prior to treatment to minimise your discomfort. Another Philips whitening option is the custom trays and Zoom Take-Home whitening kit. Our Dental Hygienist will take impressions of upper and lower teeth for your custom made whitening trays. She will go over the different strengths and applications for the Take-Home kit. There are options for overnight use and short day time use depending on gel strength, sensitivity and how quickly you want to achieve results. As with the Zoom4! 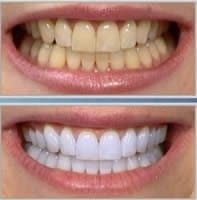 Teeth Whitening System, our Dental Hygienist will give you instructions to keep your smile nice, bright and white. How is Philips Zoom4! different? No professional whitening brand is requested by more patients than Philips Zoom4!. Dental professionals have trusted Zoom’s advanced technology and superior results backed by robust clinical evidence for more than 20 years. How long will my Philips Zoom4! results last? Whitening treatments help to reduce existing stains, but through consumption of coffee and soft drinks or just through natural aging, your teeth may eventually become discoloured again. Maintenance whitening can help combat recurring discolouration. Philips Zoom offers a variety of whitening options to help maintain your white smile. There are many causes of teeth discolouration. Some of the most common include the consumption of highly coloured foods and drinks (berries, curry, coffee, tea, red wine). Some medications, aging, smoking and trauma can also cause teeth discolouration. With Philips Zoom4!, teeth can be up to 8 shades whiter in 45 minutes. With Zoom take-home, you can achieve great results within 1-2 weeks. With Philips Zoom QuickPro whitening varnish, you can achieve a noticeably whiter smile with a 10 minute application and with little to no sensitivity.